A 35-year-old Nigerian woman has been charged with killing her husband, who she claimed abused and cheated on her with several women including her sister and their nanny's daughter. Temitope Adebamiro's husband, 37-year-old Adeyinka Adebamiro, was found stabbed in a first-floor spare bedroom of the couple's home in the 1300 block of Healy Court early Thursday, according to court documents obtained by The News Journal. pronounced him dead at 1:37 a.m. The victim, his wife, Temitope Adebamiro and their two children and nanny had been living at the home for the past two years. Officers took residents of the home – including Temitope, who was wearing blood-stained clothing to the Cpl. Paul J. Sweeney Public Safety Building near New Castle. 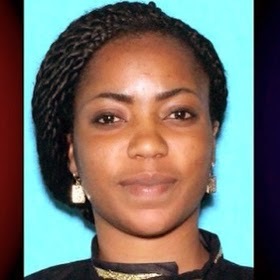 According to police and documents, the two had been married for more than 10 years, during which time Temitope told investigators that her husband physically abused her, even while pregnant with their two children. She also told investigators her husband had been cheating on her with various women, including her own sister and the nanny's daughter. The papers, however, did not say how old the nanny's daughter was. Temitope also told investigators her husband had sent her to Nigeria for several months. After returning in December, she had to stay in a hotel near the Philadelphia airport for four days because her husband refused to let her into their Red Lion home. He then paid for her to fly back to Nigeria for a few more months. About this time, she learned that her husband had spent Christmas with the nanny's daughter. The husband later flew out to Nigeria and flew back with her to Philadelphia. As he showed her the cameras inside their home over his cellphone, Temitope saw the nanny's daughter inside the home. As the investigation drew to the night before the killing, police learned the couple had been talking and watching television on the couch about 9 p.m. Wednesday. Temitope and her husband began arguing after he discovered the photos she'd taken on her cellphone and he began erasing them. As he yelled at her, Temitope told police there was a power outage at which time she went to the kitchen until power returned. But when the power returned, she found her husband in the first-floor bedroom lying in the bed. As she got closer to him, she saw a knife on the ground which she picked up and took to the kitchen. As she put it away, she noticed blood on the tip and that's when she realized that he was stabbed. While not admitting to the killing, court papers claim Temitope suggested that her husband stabbed himself. And that she changed her story several times about what happened in the bedroom, including to say that she entered first and her husband followed her in with the knife but that he later dropped it. The autopsy said the homicide was a single stab wound just below the victim's neck, about 2 inches off the center line. The stab was 4 inches deep and severed the victim's carotid artery and jugular vein. When police told Temitope that this was not a suicide, the woman "began nodding her head in agreement," according to court documents. Investigators also checked with Delmarva Power, which indicated no such power outage occurred at that time, police said.